Ever seen someone heat pressing designs onto garments and thought – “Wow! That must be so easy!”? Well, as much as it’s good to be optimistic, we have to tell you that the process is a bit complex, needing careful planning if the results are to be great. The careful planning we’re talking about here especially concerns the time and temperature of the heat press. For the transfer to look good, the temperature needs to be set correctly, and the amount of pressure applied needs to be right. Apart from that, you need to know whether to remove the carrier paper hot or cold. Deciding on all these factors can be a bit overwhelming particularly when you want the results to be faultless. 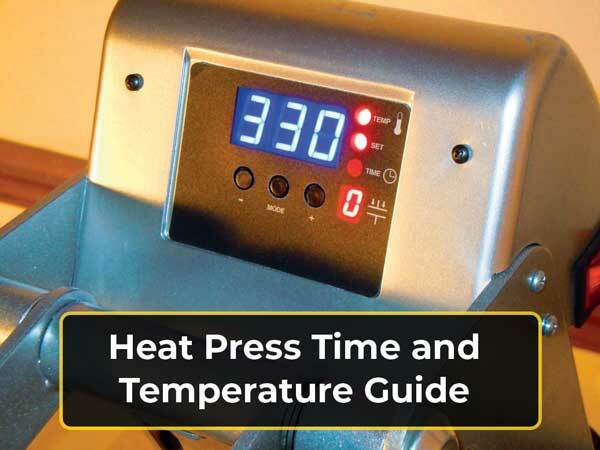 But, with this handy heat press temperature setting guide, you don’t need to worry at all. We’re going to look at the correct heat and temperature when applying a heat press to different materials. One thing to note about polyester is that it doesn’t put up with high heat levels very well. Thus, you want to set a relatively lower temperature of around 270 °F and set the time to just about 10 seconds. Peel the transfer only when hot. If the material you’re heat pressing has a lot of stretch, for instance, swimming costume, set the temperature to around 335 °F and apply the heat press for around 12 to 14 seconds. Peel the transfer while cold. If you’re using multi-purpose material, then you can set the temperature to around 350 °F and set the time to about 10 to 12 seconds. Peel – let it cool down a bit; peel the transfer when it’s warm. 1. What temperature should I set my heat press to? It all depends on the sort of fabric you’re printing. Generally, you want to set a heat level of around 350 °F when dealing with light-colored fabrics and a temperature of about 320 °F when dealing with dark-colored fabric. Less than 20 seconds pressing time should be fine. 2. How long does heat transfer vinyl need to be heat pressed? 10 to 15 seconds are enough, but there’s something else you need to know. You need to adjust the temperature to around 305 °F, and prior to applying the heat press, the fabric has got to be preheated for three seconds. 3. What fabrics can I heat press? Almost all the fabrics you can think of, actually. You can heat press cotton, polyester, nylon, lycra, spandex, leather, and the blends of these materials. 4. What temperature can I heat press glitter vinyl? You can use glitter vinyl with polyester, cotton, and other fabrics. The first thing to do is cut the material and weed the excess. Once everything is set, apply the glitter vinyl to the apparel using medium pressure, and with a heat range of 300 to 320 °F for around 15 to 20 seconds. Peel the carrier paper when the transfer is cold, and remember to wait for 24 hours before making the first wash. There you have it – the basic time and temperature chart for different sorts of fabric. In fact, we believe this guide covers all the situations you can encounter in your heat pressing business. So, there’s no more guesswork, and you’ll, therefore, work faster. And as you’ll be working with the correct settings, the transfers will be of much better quality. Though you can use an iron to make the transfers, it would be much better to get a heat press machine. With this, you’ll be able to set the correct time, temperature, and pressure more easily and accurately. Important reminder – be sure to preheat your fabric prior to applying the heat press. This way, making the transfer will be easier.